(BOSTON) — Blood-contacting implantable medical devices, such as stents, heart valves, ventricular assist devices, and extracorporeal support systems, as well as vascular grafts and access catheters, are used worldwide to improve patients’ lives. However, these devices are prone to failure due to the body’s responses at the blood-material interface; clots can form and inflammatory reactions can prevent the device from performing as indicated. Currently, when this occurs, the only solution is to replace the device. In a paper published in the April 13 issue of Nature Communications, investigators from Harvard report on a novel biochemical method that enables the rapid and repeated regeneration of selected molecular constituents in situ after device implantation, which has the potential to substantially extend the lifetime of bioactive films without the need for device removal. Their approach could also be used to load and release a number of material-bound constituents for controlled drug loading and delivery. Newer implantable devices have thin films with bioactive molecules and/or drugs that help prevent clots and inflammation while also enhancing device integration and local tissue repair, as well as inhibiting microbe colonization. For example, the blood-thinner heparin has been coated on the surfaces of cardiovascular devices to prevent clot formation on or within the devices. However, the newer devices have limitations. "Not only do they have a finite reservoir of bioactive agents, but the surface components of the thin films also degrade or lose their effectiveness when exposed to the physiological environment over time. Presently the only solution is to replace the entire device," said lead author Elliot Chaikof, MD, PhD, Chair of Surgery at Beth Israel Deaconess Medical Center (BIDMC). Dr. Chaikof is also Professor of Surgery at Harvard Medical School, an associate faculty member of Harvard’s Wyss Institute of Biologically Inspired Engineering, and a faculty member of the Harvard-Massachusetts Institute of Technology Division of Health Sciences and Technology. A number of approaches have been attempted to improve the stability and activity of thin-film constituents of implantable devices. But despite some progress, a surface coating that reliably retains its biological activity over extended, clinically relevant time periods has not been developed. 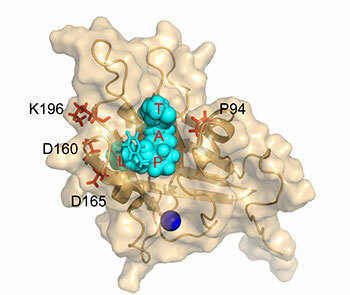 The new approach relies on an enzyme, Staphylococcus aureus Sortase A, which catalyzes the linking of two peptide sequences. By inducing a series of mutations, David Liu, PhD, Professor of Chemistry and Chemical Biology at Harvard University and a Howard Hughes Medical Institute Investigator, developed a laboratory-evolved enzyme, Staphylococcus aureus Sortase A (eSrtA), which has an enhanced catalytic activity of approximately 120-fold over the non-mutated, wild-type enzyme. eSrtA catalyzes not only linking of peptides but also breaking them apart, which it can do repeatedly. "We found that through a two-step process of removing and replacing bioactive coatings, eSrtA enables rapid, repeated thin-film regeneration in the presence of whole blood in vitro and in vivo," said Liu. "We also developed a series of new enzymes that recognize a variety of distinct peptide sequences that could be put to work in a similar manner." "But, we know that there are many questions that only further research can answer," said Chaikof. "For instance, eSrtA is a bacterial enzyme, and while there is a precedent for the clinical use of such enzymes — for example, streptokinase, uricase, and asparaginase — studies must be done to determine how immunogenic this enzyme might be." Additionally, it is unknown how often a bioactive coating would need to be regenerated, how long it would last, or whether the bioactive constituents could become inaccessible over time due to biologic processes. "Many thousands of people depend on implantable devices with bioactive constituents for their health and well-being, so finding a strategy that will ensure the long-term efficacy of these devices is of paramount importance," said Chaikof. "While this research is relatively early stage, it opens the door to a new way of approaching and addressing this clinical challenge." In addition to Chaikof and Liu, co-authors are BIDMC researchers, Hyun Ok Ham, PhD, Carolyn Haller, PhD, Erbin Dai, PhD, Wookhyun Kim, PhD, and Zheng Qu, PhD, also of the Georgia Institute of Technology; and Brent Dorr, PhD, of Harvard University. This research is supported by a grant to Drs. Chaikof and Liu from the National Institutes of Health. Beth Israel Deaconess Medical Center (www.bidmc.org) is a patient care, teaching and research affiliate of Harvard Medical School and consistently ranks as a national leader among independent hospitals in National Institutes of Health funding. BIDMC is in the community with Beth Israel Deaconess Hospital-Milton, Beth Israel Deaconess Hospital-Needham, Beth Israel Deaconess Hospital-Plymouth, Anna Jaques Hospital, Cambridge Health Alliance, Lawrence General Hospital, Signature Healthcare, Beth Israel Deaconess HealthCare, Community Care Alliance and Atrius Health. BIDMC is also clinically affiliated with the Joslin Diabetes Center and Hebrew Rehabilitation Center and is a research partner of Dana-Farber/Harvard Cancer Center and The Jackson Laboratory. BIDMC is the official hospital of the Boston Red Sox.